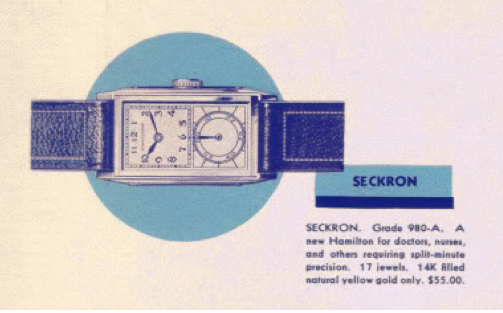 In 1935 Hamilton introduced a new concept to their lineup, the Seckron, "for doctors, nurses and others requiring split-minute precision. The watch dial has two distinct sections... one register for hours and minutes and a similarly sized register with a single, large second hand. The Seckron is a really interesting design. It uses the same 14/0 sized movement that other watches used with the exception of an extra gear train mounted on top of the movement to relocate the hour and minute hands. 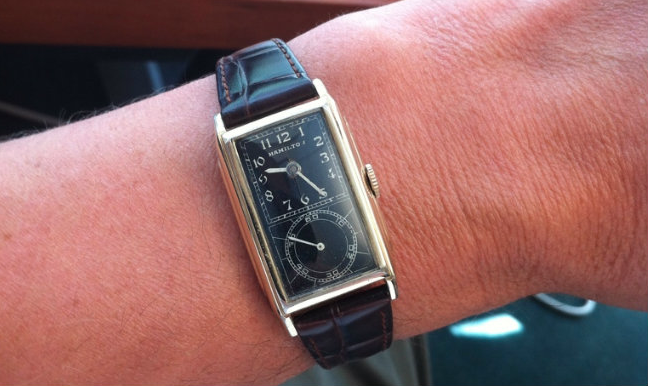 The movement is called the 980A (1935 and 1936) or 980B (1937 - 1941), depending upon the year of the Seckron, and it's almost twice as thick as a standard 17 jewel 980 movement. The case is 14K yellow gold filled and being fairly thick (to accomodate the movement) the case is rarely found without a considerable amount of wear thru to the front corners and on the reverse as well. Two different dials were available, black with white lettering or white with black lettering. In addition, dial layouts changed with the catalog years. You can find modern watches emulating this dual-dial look - but they are typically marketed as dual-timezone watches, where there are really two separate movements and each can be set to a different time. I like the Seckron and it's probably one of my top 5 favorite Hamilton models. Man, I like it too. A lot. Varies on condition but $800 to $1,200 seem to be common values. Lucky dog... make sure to get it properly overhauled so it has oil inside and doesn't wear out. I've got one of these from my great uncle. He was a MD, so it's truly a "Doctor's Watch" in this case. I've got the original case that it came in. It's pretty cool, and has some family history. That said, I wonder if I should sell it while the economy is good and folks have disposable income for such things? I'll doubtful use it, and I'd contribute the money to a college savings plan for my girls for the future. Any thoughts/advice from anyone would be greatly appreciated. Think it's work selling? Or bad idea since it's a family heirloom? Family pieces are the best but they are also just "stuff". The decision to keep or sell is entirely yours.